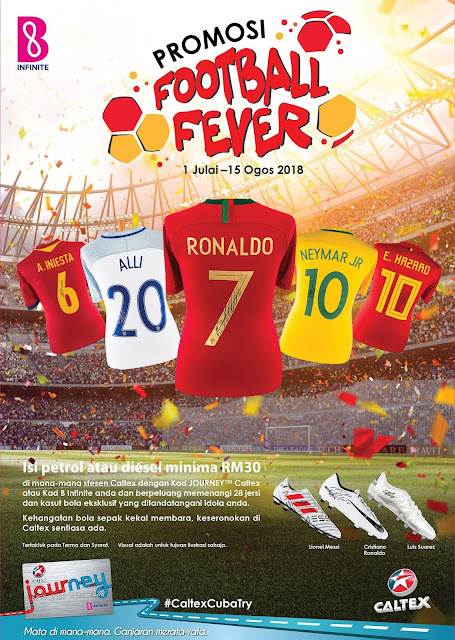 The Football Fever continues at Caltex®, as Chevron Malaysia Limited, which carries the Caltex® brand, announced a nationwide campaign curated especially for die-hard football fans. The campaign began recently and is in conjunction with the 2018 World Cup held in Russia, where customers stand a chance to win exclusive autographed jerseys and football boots by Neymar JR (Brazil), Andres Iniesta (Spain), Dele Alli (England), Eden Hazard (Belgium), Cristiano Ronaldo (Portugal), Lionel Messi (Argentina) and Luis Suarez (Uruguay). From now until August 15, 2018, customers need only spend RM30 on a fuel transaction in a single receipt at Caltex® stations nationwide to stand a chance to win these exclusive merchandises. A total of 28 lucky winners will be selected at the end of the campaign. To excite more football fans across the nation, Caltex® has also announced a social media contest. The first-round winner recently took home a pair of autographed Lionel Messi Boots. Round two of the social media contest is still on-going until this 15 August 2018, with the winner bringing home an autographed Neymar JR Jersey. The winners from the social media contest are selected based on the most creative picture and accompanying caption. Caltex® believes just like the World Cup which is one of the most sustained sporting events, the sustainability for engines are a priority to the brand. Caltex® has continuously proven time and time again that the brand’s quality products are able to provide maximum protection and deliver first-class performance for engines. For more information on Caltex® and its products, please visit www.caltex.com/my or follow their social media at https://www.facebook.com/Caltex.Malaysia/ for the latest updates.The Football Fever continues at Caltex®, as Chevron Malaysia Limited, which carries the Caltex® brand, announced a nationwide campaign curated especially for die-hard football fans. For more information on Caltex® and its products, please visit www.caltex.com/my or follow their social media at https://www.facebook.com/Caltex.Malaysia/ for the latest updates.